G-protein-coupled receptors comprise the largest family of mammalian transmembrane receptors. They mediate numerous cellular pathways by coupling with downstream signalling transducers, including the hetrotrimeric G proteins Gs (stimulatory) and Gi (inhibitory) and several arrestin proteins. The structural mechanisms that define how G-protein-coupled receptors selectively couple to a specific type of G protein or arrestin remain unknown. Here, using cryo-electron microscopy, we show that the major interactions between activated rhodopsin and Gi are mediated by the C-terminal helix of the Gi α-subunit, which is wedged into the cytoplasmic cavity of the transmembrane helix bundle and directly contacts the amino terminus of helix 8 of rhodopsin. Structural comparisons of inactive, Gi-bound and arrestin-bound forms of rhodopsin with inactive and Gs-bound forms of the β2-adrenergic receptor provide a foundation to understand the unique structural signatures that are associated with the recognition of Gs, Gi and arrestin by activated G-protein-coupled receptors. 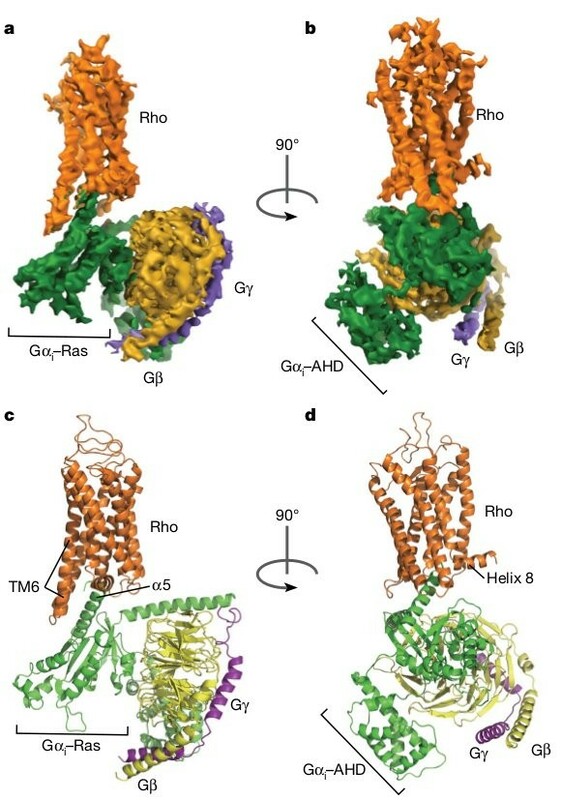 The cryo-EM structure of the rhodopsin–G i complex. structure of the rhodopsin–G i complex.